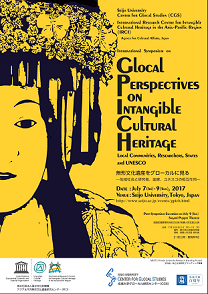 IRCI hosted an international symposium ‘Glocal Perspectives on Intangible Cultural Heritage: Local Communities, Researchers, States and UNESCO’ from 7th to 9th July in Tokyo under the joint sponsorship of Global Study Centre of Seijo University and Agency for Cultural Affairs. 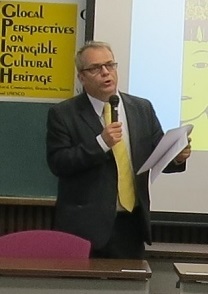 This symposium started with a keynote speech by Mr. Koïchiro Matsuura, Former Director General, UNESCO. The main part of the symposium was comprised of 5 sessions. Participants actively discussed and analyzed how ICH has been safeguarded at the administration level and also at the community level. They also examined, from local as well as global perspectives, how local communities, researchers, states and UNESCO have been interacting in the process of safeguarding heritage. 15 significant case studies were shared in these sessions. The output of this symposium will be published later date. 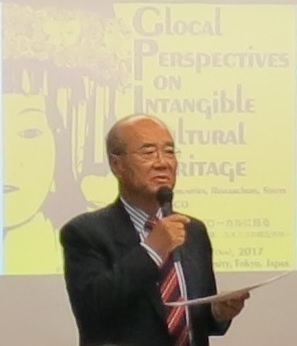 ※This symposium was organised as part of IRCI’s “Mapping Studies on the Safeguarding of Intangible Cultural Heritage (ICH)” to promote the research which contributes to the safeguarding of ICH in the Asia-Pacific region.